Susanna Isabella, an Internationally recognised Medium Clairvoyant, Artist and Healer, for the past 40 years, has been the bridge between this world and other worlds of the spiritual realms. Whether you are looking to connect with a loved one who has passed over, or to receive messages or guidance from your spirit guides or higher self, Susanna can make those connections for you. By channelling the Divine, Susanna can ask questions on your behalf, and through dialogue with the Divine and from across the realms, through the past, present and the future, from your past lives or your future lives she can gain those answers to what your heart is seeking. Also, throughout the readings, whilst channelling the pure Divine energy, Susanna brings this energy into the session and provides an energetic healing for her clients, bringing them clarity, peace, purpose and a re-energised level of joy. Individuals can also have their own personal rituals; some sports people in particular are known for this: Tiger Woods apparently always wears a red shirt when competing on Sundays, and Rafael Nadal always points the labels of his drinking bottles toward the end of the court he’s about to play from. Some rituals have originated in behaviours that had a practical value; one theory is that the handshake began as a way of conveying peaceful intentions: by extending their empty right hands, strangers showed that they were not holding weapons (and shaking up and down was allegedly to dislodge hidden daggers). Rituals can also build and reinforce community, group and team identity through shared experiences. They can help us to move from one stage of life to another, and to handle and transform emotions such as anxiety or grief. They can boost our confidence, and positively influence our life experience by consciously changing beliefs. Transitional rituals (events that mark a person's transition from one status to another) can help us to move from one life stage to the next, or from one year to the next. They are performed at times of, or in recognition of, significant changes in a person’s life, such as our birthday, entering puberty and/or adulthood, a new year/new century, marriage and death, loss of a loved one, and even becoming a parent..) Coming-of-age rituals are particularly powerful in creating identity, as they signify the move away from childhood and into adulthood. 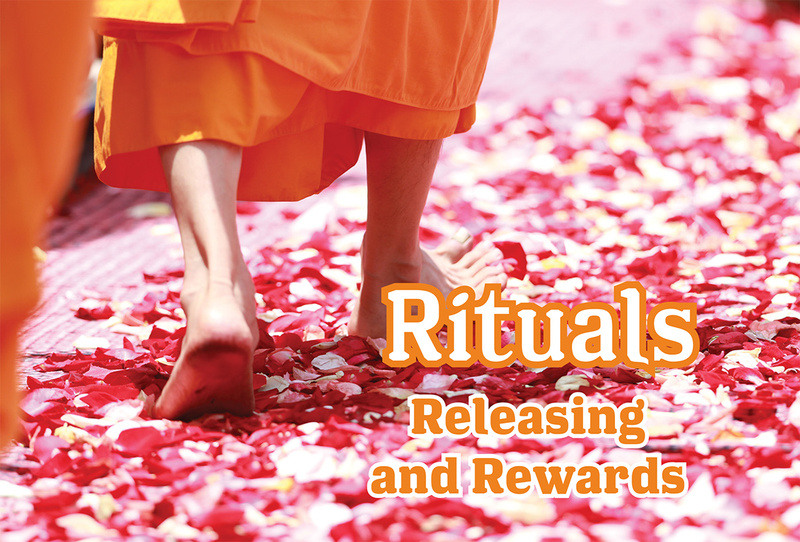 Unlike habits, which often occur automatically and without thought, rituals are generally mindful – a series of actions carried out with conscious intention, for a specific purpose. Rituals have been described as magical: the conscious intention of ritual engages the power of your mind, spirit, and subconscious. Not only do rituals invoke the power of positive thinking, but they create a subconscious drive towards achieving the intention. Research studies have demonstrated that rituals, even those that we might create for ourselves such as ceremonially burning letters from a faithless lover, can alleviate grief. Rituals performed before high-pressure tasks reduce anxiety and increase confidence and performance levels. They don’t alter reality or circumstances, but they can help us to release tension and pain, freeing us energetically to move forward in life. Over time, the role and the significance of longstanding rituals have been diminished in many people’s lives. In many ways, social media has replaced physical connections and gatherings, an emphasis on firm scientific evidence has outweighed what might be seen as superstitious practices. Transition rituals in some situations occur more out of habit, so they are empty and almost meaningless, rather than a recognition of someone’s transition into adulthood, an 18th birthday can simply be an opportunity to legally get drunk for the first time. Speaking of Australian youth today, Dally Messenger, a civil celebrant and author of Ceremonies and Celebrations, has said: ‘Many young people feel they are on their own, they don’t belong, they are not supported. The reason? The community has never told them that they belong – in the serious way known as a ceremony’. And from American academic, Aiden Kelly: ‘Since ritual is a need, and since the mainstream of Western civilisation is not meeting this need, a great deal of what’s happening these days is simply people’s attempts to find ways to meet this need for themselves’. It can be helpful and productive to create and act out (alone or in company) a ceremony that represents in a concrete way, the emotional release or positive outcome you are seeking. Even self-created and seemingly mundane ceremonies, when undertaken mindfully, have been demonstrated to create change at an emotional level, enabling us to respond differently. In view of the important contribution that rituals make to community, group and individual lives, Elizabeth Gilbert has the final say: ‘If your culture or tradition doesn't have the specific ritual you are craving, then you are absolutely permitted to make up a ceremony of your own devising’. Experienced Reiki practitioner and teacher, co-author of Turning Points, Regaining Joy after Loss. only $15 for 1 year or $25 for 2 years.